When things “don’t go according to plan,” it typically invokes a negative thought. 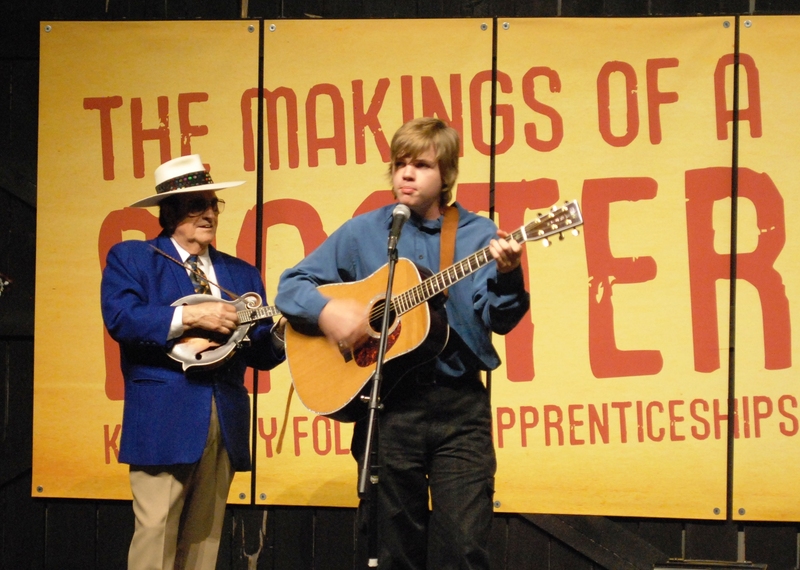 But my unplanned adventures with Grand Ol’ Opry star Bobby Osborne, through the Kentucky Arts Council’s Folk and Traditional Arts Apprenticeship Program, were quite the opposite. What were going to be bimonthly mandolin lessons and history chats turned into performing with one of the most famous artists in bluegrass music history. I was able to perform at venues and locations throughout the South including: the Ohio Valley Opry; Mount Airy, North Carolina; the Thomas D. Clark Center for Kentucky History; the Kentucky Coal Rally; and the highlight, the world famous Bean Blossom Bluegrass Music Festival. Bobby and Cory perform during the “Makings of a Master” debut at the Thomas D. Clark Center for Kentucky History. My experiences with Bobby were not limited to just musical ones. I believe it would be safe to say that I learned just as much, or even more, about the history of the music I was playing than the music itself. I was able to learn about the history and source of some of the most popular songs in bluegrass and country music. Also, I learned facts, stories and legends about some of the most famous icons in music; all told from a first-person perspective by a man who was there. My experience with Bobby Osborne, through the generosity of the Kentucky Arts Council’s apprenticeship grant, has been a literal dream come true. I was able to be a part of something that many young musicians only dream of, and I am humbly thankful. I would like to express my sincere gratitude to: Mark Brown, Bob Gates and everyone at the Kentucky Arts Council; Bobby Osborne and all the members of the Rocky Top Express, and all of the other countless friends and family who have supported me through the amazing twelve months of my apprenticeship. You all have my deepest heartfelt thanks and gratitude. And to all the other young musicians out there, dreams do come true. God Bless and keep on picking! To learn more about folk arts apprenticeships in Kentucky, visit the Makings of a Master exhibition when it travels near you. The next application deadline for the apprenticeship grant program is February 15, 2013. God bless you Cory What a blessing you are to us. We know that you are our family, but not just that thought for you are a fine young man with a God given talent that you have used to help glorify our God. Thank you!